Thanks to Mr. Clément Puppo, French speaking people can read the info/FAQ post in their native language. If you wish to translate the FAQ to your own language, and maybe later the game text, let me know. I finally started to make all the planned rooms for area4, and this one will be very different from the original. I´m not adding too many new places, but it will be something much more interesting than the original corridors. - This is a Work In Progress video preview, you saw how things have changed from the first trailer, things are gonna change even more (for the better I hope). - Gammas are not complete yet. There are minor things to tweak, and I still have to animate them more naturally. - The Alpha intro will be redone eventually, the current version isn´t dramatic enough (you´re right). - Arachnus will look different. Right now all I´ve done with him is the intro with the Fusion sprite. - I recorded the footage with a script that took a screenshot on every frame, and since I recorded the game running quite slow, the resulting animation looks like a Tool Assisted Speedrun. There´s no rapid fire, it´s just me firing unusually fast. If you look at the battle with the Shirk, I try to control the firing speed with the beam. - Tiles and backgrounds will be worked on, it´s not prioritary right now. It´s good to see people with solid opinions on how to make the game better, I appreciate your suggestions. Yes, perfect. See, this is what makes a game awsome, when the maker actually listens to feedback. Glad to see you're listening to us. Now i'm really curious as to what you're adding in area 4, i'm excited! can you translate the FAQ and the game info into english please i would be very grateful k thanks. The FAQ was written in english originally. Look at the right column, click the link labelled "FAQ". The questions are outdated, I guess I´ll have to change some questions. This project more and more I am amazed!. I have great expectations of the game ended. also good to know that area 4 is much better than the last. Lately I've been playing again the "Metroid 2 return of the samus" and makes me short. I hope that this project is unparalleled in the past. thanks again! Este proyecto cada vez mas me asombra!. tengo una gran expectativa del juego finalizado. ademas que bueno saber que area 4 sera mucho mejor que el anterior. 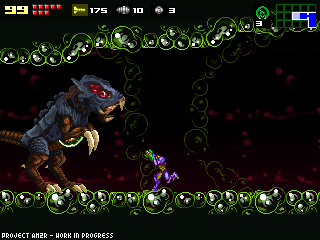 ultimamente he estado jugando denuevo el "metroid 2 return of the samus" y se me hace corto. espero que este proyecto sea inigualable con los anteriores. gracias denuevo! Yeah, I think the main thing to do now is to eventually complete the game to a good and exciting standard; and then tweak sprites and tiles etc.to make the game perfect! I loved the video and what consideration you have taken from the comments. Keep up the good work! How about a German version? You know those tunnels that you have to shoot a lot to get through? You know I think there is a Metroid fight in one of them. Well anyways, how about a support system? So if you destroy enough of those blocks then the top collapses partially? That would make my day to learn that you could do that. Sorry if this is not clear, my English is not very good. If you need me to clarify just write me at the M:FM. I can help with an italian translation if you need. Do I risk to see huge spoilers if I translate the game as well? I never played it. I would love to see this game translated into Japanese, Kanji and Katakana, for our Japanese friends who created the game. I wish I could help with this, but unfortunately, I do not yet know enough to help. See, I always liked how you lead this game, but I'm not a big fan of the Zero Mission animation style, so it made me feel a litle more cautious about the project. Well, your last trailer made me rethink my ideas of your work. It's really coming out nicely! my favorite part where you fight between two automs and destroy another enemy (don't know the name), exploding it in several small pieces, very natural looking. Good Work, DM64! Dude,this is so totally awesome. Thank you for developing this remake. Ever since Metroid Zero Mission was released,i have been waiting for someone to do the same for the second Metroid game. Thank you,from the bottom of my mousy heart i thank you. I can hardly wait for it's completion. Me and others who are a fan of Metroid deeply support this! And we hope you don't quit making this! Wouldn´t putting secret tunnels that enables skipping whole areas in the game kind of ruin the idea of speedrunning the game? Haha! It's good to see that you take the comments so well; it shows how much you care for the project. The increased arc path for the wave beam is nice, and the beam itself looks wonderful when all three parts are there, but due to the linear nature of the sprite, the "nice" look collapses when there's only one stray waving component. I'm not sure whether it'd be more easily fixed by rotating the sprite of the bullet itself along the path, or by making the bullet round and allowing for a trail effect behind it, but... otherwise everything looked really nice. I wish you the best of luck in your continued effort. I would love to help you out somehow but I do not know your spriting methods. Hopefully you will manage to keep a good schedule and lifestyle ;-), because what i've seen in the new trailer was quite a leap from the last one, you must be hard at work, and I as the rest of us appreciate it! I'm french and I could translate the FAQs, the whole game and everything else in french. I'm learning Game Maker myself. I wanted to know if there was a possibility of getting the .gmk of the game (or the demo) for reference? Great work btw! Great job on the animations and the framerate and all the effects, they really add a lot. the game will be in 4:3? It'd be even better if you could incorperate an option for hq2x/hq3x/hq4x, but that may be pushing it. Ich habe endlich mit all den geplanten Räumen für Areal 4 angefangen und kann jetzt schon sagen, sie werden sich sehr vom Original unterscheiden. Ich werde nicht zu viele neue Orte einfügen, aber es wird etwas viel interessanteres als die original Korridore. - Gammas sind noch nicht fertig. Es gibt noch Kleinigkeiten zu verbessern und ich muss sie noch natürlicher animieren. - Das Alpha Intro wird noch überarbeitet, es ist nicht dramatisch genug (Da habt ihr recht). - Arachnus wird anders aussehen. Ich habe bisher noch nichts gemacht außer das Intro mit dem Fusion Sprite. - Ich habe das Video mit einem Script aufgenommen, das einen Screenshot pro frame macht. Und da das Spiel gerade sehr langsam lief, sieht die Animation aus wie ein Speedrun mit Hilfsmittel. Es wird aber kein Rapid Fire geben, das bin nur ich der so schnell feuert. Wenn ihr euch den kampf mit dem Shirk anseht merkt ihr, dass ich dort versuche meine Feuergeschwindigkeit anzupassen. - Tiles und Hintergründe werden noch überarbeitet, hat momentan keine Priorität. Es ist schön, so viele begeisterte Menschen mit guten Ideen zu sehen, ich freue mich über Vorschläge. Dude, you're amazing! Keep the progress, I can't wait to see how this game will be! Once again, Congratulations! Yo Doc, if you're interested, they posted your latest video over at the gaygamer.net blog. Spike, I didn't see any error's. Your English isn't very good? You speak (or technically type) it pretty well on the GMC. If you don't know who I am, I'm MegaManFan1 of the GMC, SmbzFan2nd of newgrounds and chatango, and MetroidMan347 pretty much everywhere else. Oh hey man, why the no reply to the conversation we were having? Hey Doc, I just read 2 news articles that gave high praise to your third trailer, calling it an amazing fan remake. The thing is, they both stated that Nintendo will shut down the project eventually. They know because its happened before with games like chrono trigger resuerection and some other game. Have you thought about inserting weather/atmospheric changes into the different areas? I realize that in the prior games there were things such as superheated/freezing rooms that affected your energy. Perhaps poisonous gas that drains away energy slowly, or maybe some fog to add to the atmosphere of some of the subterranean areas. As Henry brought up, I think limited sequence breaking should be kept in the game just like in the original for an additional challenge during speed runs. In the original, I thought it was a fun challenge to run though the lava to get to battle the alpha and gamma metroid that were tucked away in a little corner just so I could kill them and not have to backtrack later when the path was clear. I don't think being able to skip areas entirely should be done, but I do think taking a lava swim or other difficult maneuvers like it should allow you access to areas earlier then you should in order to be rewarded with powerful items earlier in the game or a faster overall speed run to avoid backtracking later when the path is legitimately open. Just to let you know. I can't wait for this game to come out. It will be AMAZING. Thanks so much for making this game. I love 2d Metroid games and can't wait to play this one. You have so many praising comments already but I'd just like to add mine! I just think it is absolutely amazing how much effort you are putting into this, it looks absolutely astonishing. I am also very impressed you are actively reading and responding to critique, to make sure it is as good as possible. I can translate it into German. I'll PM it to you on the GMC. You know, Metroid 2 was actually one of the last Metroid games I played just because I never actually owned or played it back when it came out on Gameboy. But no one can deny its significance as a key plot in the series and after Zero Mission I too pondered the possibility of a remake but alas nothing of the like. Your project looks to be very promising and I look forward to seeing it in its entirety. Consider this Metroid fan very impressed and keep up the good work.